When using the Union, Except or Intersect Set operators, SAS does not overlay the columns by the column names. Instead, it overlays the column by its position. This could cause major issues when not handled properly. 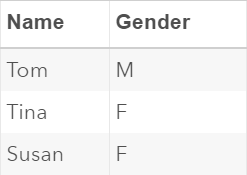 The DS1 and DS2 tables each contain a list of three names. Note: the second column from the two tables are not the same. 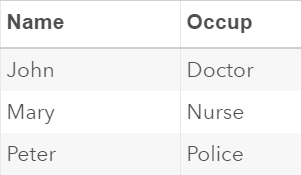 One contains the occupation data and the other contains the gender information. Now, let's concatenate the two tables using the Union Set operator. Although the second columns from the two tables do not share the same column name, they are overlaid into one column! SAS does not overlay the column by the column names when using the Union Set operator. The same is also true for the Except and Intersect operators. Instead, SAS overlays the column by its position in the table. The second column from one table will overlay the second column from the other table, regardless of the column name. The column name from the second table will be ignored. If you'd like the columns to be overlaid by the column name, you can use the CORR keyword after the Union Set operator. 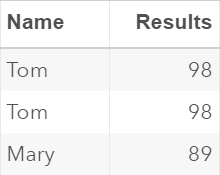 The CORR keyword tells SAS to overlay the columns by its corresponding column name. Columns that have the same name across the two tables will be overlaid into one column. However, the columns that don't appear in both tables will be removed from the output. In our example, the output table contains only the NAME column. The OCCUP and GENDER columns are removed, since they don't appear in both input tables. As we have learned in the previous sections, SAS removes the duplicate rows when concatenating the tables using the Union, Except or Intersect Set operators. The ALL keyword can be used to tell SAS to keep the duplicate rows in the output. 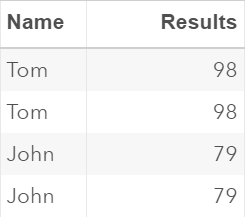 You can clearly see that some rows, such as Tom and John, are duplicated. Let's concatenate the tables using the Intersect Set operator. Now, if you are hoping to keep all of the duplicate rows of Tom, you can use the ALL keyword after the Intersect Set operator. The LIST1 and LIST2 tables each contain a list of three customers and their gender. Write a Proc SQL step to concatenate the two tables using the Union Set operator. Make sure the same columns are overlaid in the output table.